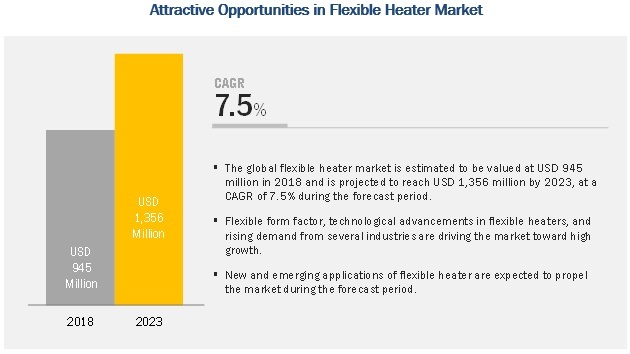 [148 Pages Report] The flexible heater market is expected to reach USD 1,356 million by 2023 from USD 945 million in 2018 at a CAGR of 7.5%. The factors such as a wide range of applications and rising demand from several industries are driving the growth of the flexible heater market. Also, the flexible form factor, technological advancements, launch of innovative products, and high adoption of flexible heaters in medical applications are several other factors driving the market toward significant growth. The market for silicone rubber-based flexible heaters is expected to grow at the highest CAGR during the forecast period from 2018 to 2023. The largest market size of silicone rubber-based flexible heaters is attributed to the use of these heaters in semiconductor systems (plasma etch systems, probing stations, IC test handling equipment, photo-resist track systems), electronics appliances (refrigeration equipment, coffeemaker, and wax-maker), and applications in medical, aerospace & defense, food & beverages, automotive, and oil & gas and mining. Increasing demand for such systems and products is expected to drive the silicone rubber-based flexible heater market toward highest growth during the forecast period. They are durable and can withstand the maximum operating temperature of 450°F (232°C). Among various industries, the electronics and semiconductor is expected to have the largest market share and exhibit the highest CAGR in the flexible heater market during 2018–2023. These heaters are used in semiconductor manufacturing such as in plasma etch systems, probing stations, IC test handling equipment, photo-resist track systems, copy machines, LCD screen preheating, ATM machines, semiconductor test modules, handheld scanners, and various other equipment. The applications of flexible heaters are also found in electronics such as in refrigeration equipment, coffeemaker, and wax-maker. The increase in demand for such products is expected to drive the market for flexible heaters used in the electronics and semiconductor industry. With the largest share and highest CAGR, APAC is expected to dominate the overall flexible heater market during the forecast period. 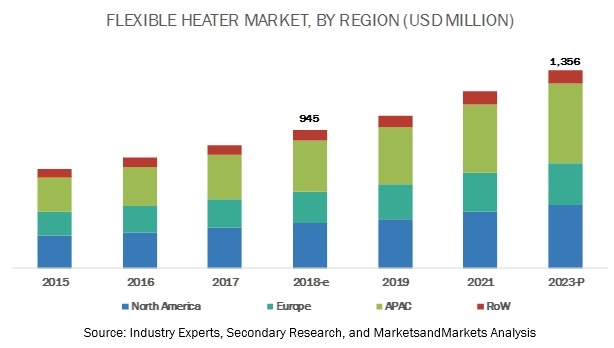 The growth of flexible heater market in APAC is mainly attributed to the increasing demand for these heaters in various medical devices, analytical instruments, avionics and defense systems, semiconductors, and commercial food equipment. The electronics and semiconductor, and automotive industries are flourishing in APAC, and the demand for medical devices and food equipment is expected to grow at the fastest pace in this region in the coming years. The economic growth of APAC, along with the advantage of lower operating costs in countries such as China and India, is expected to drive the market for silicone rubber-based flexible heaters in this region. APAC is the largest market for electronics and semiconductor production, which is primarily dominated by countries such as China, India, Japan, Korea, and Taiwan, and is expected to rise further in the coming years. Key players in the market include NIBE Industrier AB (Sweden), Honeywell International Inc. (US), Omega Engineering (US), Watlow Electric Manufacturing (US), Smiths Group plc (UK), Chromalox (US), Rogers Corporation (US), Minco Products, Inc. (US), Zoppas Industries S.P.A. (Italy), All Flex Flexible Circuits (US), and so on. In March 2018, Rogers Corporation introduced ARLON rapid polyimide (raPld) substrate, a new and innovative solution for streamlining the manufacturing process and improving the performance of flexible heater applications. Designed with new construction, raPId substrates combine the benefits of polyimide heater dielectrics with the flexibility and usability of a silicone adhesive system. In February 2018, NIBE acquired Hemi Heating. Hemi Heating manufactures heating jackets, heating tents, heating cables, heater fans, and several different temperature control options. Founded in 1991 and having the annual turnover of ~USD 2.4 million, Hemi Heating became a part of NIBE Element business segment as a subsidiary of Backer BHV. In January 2018, NIBE acquired BriskHeat, which became a part of NIBE Element business segment. Founded in 1949 and with the annual sales of USD 39 million, BriskHeat has ~650 employees. It is involved in the manufacturing of cloth-heating jackets for the semiconductor, composite, petrochemical, plastic, and consumer product industries. Where will the current developments take the flexible heater market in the mid to long term? What are the upcoming opportunities for flexible heater providers in different industrial applications? What is the growth expected from different types of flexible heaters and what would be their impact on different industries? Which are the top applications in the flexible heater market to invest in and what are the untapped opportunities? Which are the major current and potential competitors in the market and what are their top priorities, strategies, and developments? The study involved 4 major activities to estimate the current size of the flexible heater market. Exhaustive secondary research was done to collect information on the market, including the peer market and parent market. The next step was to validate these findings, assumptions, and sizing with industry experts across value chain through primary research. Both, top-down and bottom-up approaches were employed to estimate the complete market size. Thereafter, market breakdown and data triangulation were used to estimate the market sizes based on segments and subsegments. In the secondary research process, various secondary sources have been referred to for identifying and collecting information for this study. Secondary sources include corporate filings (such as annual reports, press releases, investor presentations, and financial statements); company website; Factiva; Bloomberg; trade, business, and professional associations; white papers; marketing-related journals; certified publications and articles from recognized authors; gold- and silver-standard websites; directories; and databases. Secondary research has been conducted to obtain key information about the supply chain and value chain of the industry, total pool of key players, market segmentation according to industry trends to the bottommost level, geographic markets, and key developments from both market- and technology-oriented perspectives. Secondary data has been collected and analyzed to arrive at the overall market size, which has been further validated through primary research. In the primary research process, various primary sources from both supply and demand sides have been interviewed to obtain qualitative and quantitative information. 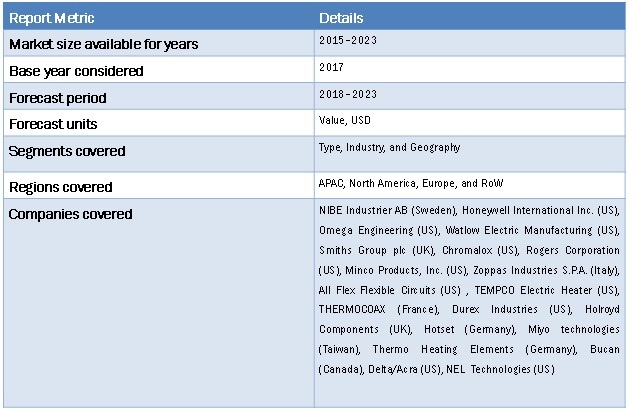 Primary sources from the supply side include experts such as CEOs, VPs, marketing directors, technology and innovation directors, subject matter experts (SMEs), consultants, and related key executives from major companies and organizations in the flexible heater market. After the market engineering process (which includes calculations for market statistics, market breakdown, market size estimations, market forecasting, and data triangulation), extensive primary research has been conducted to gather information, as well as verify and validate the critical market numbers. 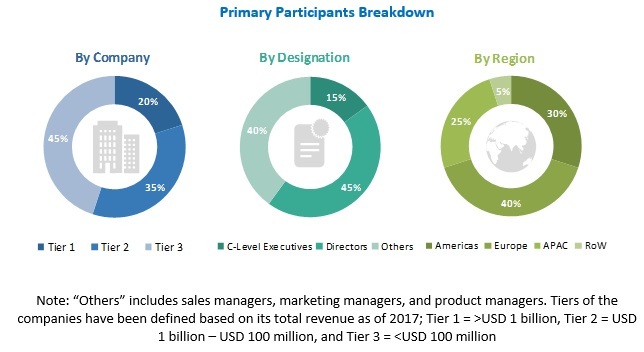 Primary research has also been conducted to verify the identified segmentation types, industry trends, key players, competitive landscape, and factors affecting the market dynamics (such as drivers, restraints, opportunities, and challenges), along with the key strategies adopted by players. Primary interviews have been conducted with experts from both demand and supply sides across 4 major regions—APAC, North America, Europe, and RoW. ~30% of the primary interviews have been conducted with demand-side experts and 70% with supply-side experts. Primary data has been collected through questionnaires, e-mails, and telephonic interviews. In the market engineering process, both top-down and bottom-up approaches have been used, along with several data triangulation methods, to perform market estimation and forecasting for the overall market segments and subsegments listed in this report. Extensive qualitative and quantitative analyses have been performed on the market engineering process to list key information/insights. Key players in the market have been identified through secondary research, and their market ranking in the respective regions has been determined through primary and secondary research. This involves the study of the annual and financial reports of the top players and interviews with industry experts (such as CEOs, VPs, directors, and marketing executives) for key insights—both quantitative and qualitative. All percentage shares, splits, and breakdowns have been determined using secondary sources and verified through primary sources. All the possible parameters that affect the markets covered in this research study have been accounted for, viewed in extensive detail, verified through primary research, and analyzed to obtain the final quantitative and qualitative data. This has been consolidated and supplemented with detailed inputs and analysis from MarketsandMarkets. After arriving at the overall market size from the market size estimation process explained above, the overall market was split into several segments and subsegments. To complete the overall market engineering process and arrive at the exact statistics for all the segments and subsegments, the market breakdown and data triangulation procedures have been employed wherever applicable. Data has been triangulated by studying various factors and trends from both demand and supply sides.